This month, the Kosher Connection challenge is Super Bowl foods/finger foods. I knew right away that we had to include this recipe for hot and spicy cauliflower Buffalo wings — a vegetarian version of Buffalo-style chicken wings slathered in hot sauce. The cauliflower wings are gluten-free and can also be made dairy-free, making them a great appetizer for all. Last summer, we took a road trip to Rochester, NY, to visit family. We ate dinner at The Owl House, which offers a large selection of vegetarian, vegan and gluten-free dishes. We ordered the cauliflower wings and, surprisingly, my daughters gobbled them up, even though they were incredibly hot. My oldest daughter asked to make the recipe at home, which we did over New Year’s. 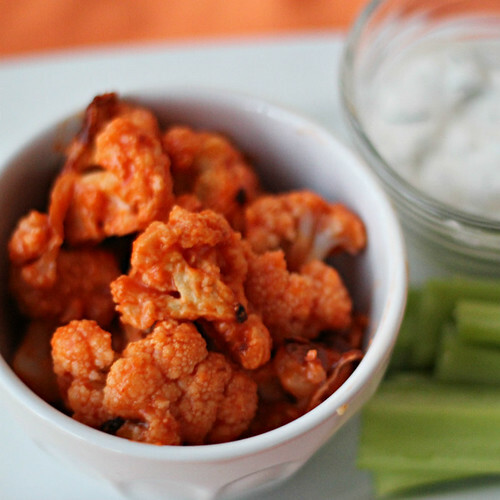 These cauliflower wings have the same spicy hot flavor as Buffalo chicken wings, but they are vegetarian, baked not fried, and made gluten-free and guilt-free. Plus, you don’t have to pick up the chicken wings and try to gnaw the meat off the bones, getting your hands full of hot sauce in the process — something I never liked very much. Traditionally, Buffalo wings are served with celery sticks and blue cheese dressing to cool your palate. But I can’t abide blue cheese, so I’ve included a recipe for homemade herby dressing made with Greek yogurt, as a healthy alternative. If you are making a dairy-free meal, just omit the dip. Also, I’ve made this recipe both with almond milk and with whole milk. I don’t know if it was just the luck of the draw, but when I made it with whole milk, the batter around the cauliflower started to turn too brown, where it was a nice golden color using the almond milk. Also, I used chickpea (garbanzo) flour to impart a little nuttiness, but any gluten-free flour (or regular flour, if you eat gluten) is fine. Since these gluten-free cauliflower Buffalo wings are hot and spicy, they pair excellently with beer (gluten-free beer, of course). The red hot wings make a nice nosh during the Super Bowl — especially during the half-time show with the Red Hot Chili Peppers (the part I am looking forward to). For Super Bowl and finger food recipes from other bloggers (please note that not all are gluten-free), please check out the Kosher Connection linkup by scrolling to the end of this post and clicking on the frog icon below, which will take you to a page with thumbnails of other Super Bowl/finger food recipes. Preheat oven to 425 degrees. Line a baking sheet with aluminum foil and coat with cooking spray. 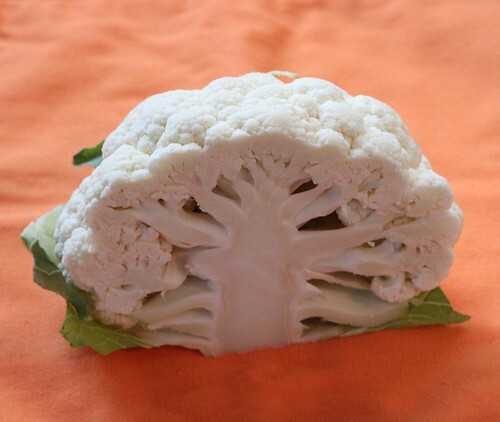 Cut cauliflower into medium-sized florets. Combine the flour, milk and garlic powder in a large bowl, and beat well with a fork to combine. Drop the cauliflower pieces in the bowl, and stir to coat thoroughly with sauce. Pick up cauliflower pieces, letting extra batter drip back into the bowl, and put them on prepared baking sheet. Bake for 20 to 25 minutes, until tender. In a large bowl, mix hot sauce with olive oil. 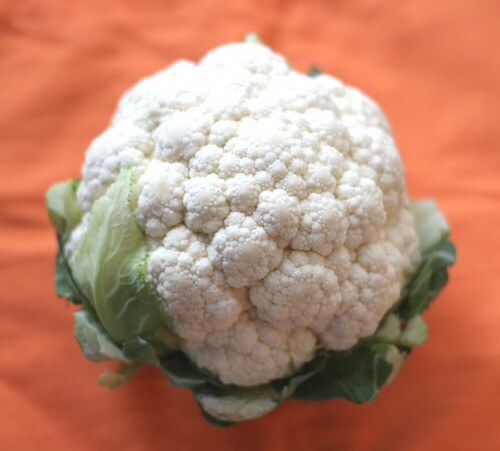 Remove cauliflower from the oven and toss it in the hot sauce. Mix all ingredients together in a medium bowl. 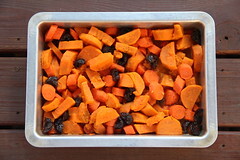 Refrigerate for at least one hour prior to serving to let flavors mingle. 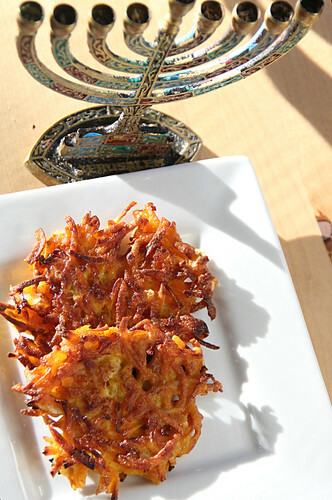 Butternut squash latkes, gluten-free and dairy-free, spice up your Hanukkah menu. We had an early Hanukkah celebration over the weekend (as if Hanukkah wasn’t early enough this year), and these gluten-free, dairy-free butternut squash latkes were the surprise hit of the night. Moist and flavorful, they stole the show, leaving the ordinary potato latkes sitting on the plate. Spiced with cumin, curry and cinnamon (the perfect trifecta of spices), the latkes have a slight pumpkin taste that’s perfect this year for Thanksgivukkah. It’s actually easier to make butternut squash latkes than potato latkes, because the squash can be peeled and cut in advance, it doesn’t turn brown when exposed to air and it doesn’t weep water like grated potatoes do. While potato latkes are traditional, Hanukkah is about the miracle of the oil, not about the miracle of potatoes. So fry these butternut squash latkes in some oil and create a new Hanukkah tradition. This year, I’ve been fortunate to participate in the Kosher Connection, a group of food bloggers who participate in monthly blog challenges. I’ve enjoyed having inspiration (and a kick in the pants) to come up with new, themed recipes. 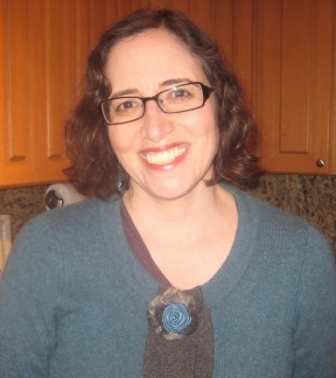 This month, in honor of the Kosher Connection’s first anniversary, we are having a blog swap. Participants were assigned another blog to cook from, and then we could choose to make any recipe on the assigned blog. There’s also a giveaway contest — info is at the end of this post. I was excited to be assigned the Couldn’t Be Parve blog. Most of Shoshana’s recipes are for desserts, and I absolutely love to bake (and eat) desserts. Also, many of her recipes are gluten-free or have gluten-free substitutions, and all of her recipes are parve, which means they don’t contain dairy or meat. As you know, my youngest daughter has celiac and is on a strict gluten-free diet. But my oldest daughter (11) has been having stomach problems on and off for the past year. She’s been tested for celiac and doesn’t have celiac. My hunch is that she has a lactose/dairy intolerance. (One doctor said IBS, which kind of ticks me off because that just means, “I have no idea and don’t want to deal with it.”) Anyway, we’ve been trying a dairy-free diet to see if that makes her feel any better. 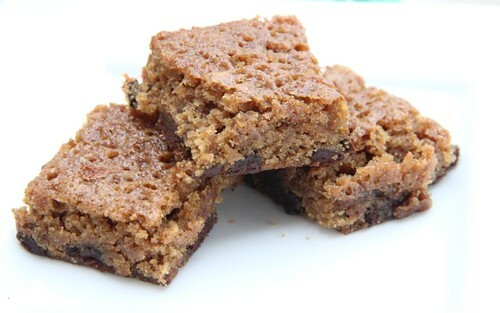 So I was thrilled to see all the great dairy-free recipes on the Couldn’t Be Parve blog. Even though many of the recipes on the site are gluten-free, I have a perverse need to make things difficult for myself, so I picked a non-gluten-free recipe to make. Her Lemon Pound Cake with Strawberry Rhubarb Compote looked so good that my daughters and my mother unanimously voted for it. We love all things lemon, like my sweet-tart Luscious Lemon Squares. I subbed gluten-free flours and amped up the lemon. The cake turned out dense, rich and lemony, though my version did fall a little bit in the center. Since I didn’t have rhubarb, I made a strawberry-apple compote, which should be served on the side so it doesn’t soak into the cake too much. Thanks, Couldn’t Be Parve, for the lemony inspiration and great recipe! Line an 8 x 4-inch loaf pan with parchment paper. Whisk together the gluten-free flours, baking powder and xanthan gum in medium bowl. Set aside. Preheat oven to 350 degrees. In a stand mixer, beat eggs, sugar and salt until light and fluffy, about 3 to 5 minutes. Decrease speed and beat in canola oil, then mix in lemon zest, lemon juice, lemon extract and vanilla extract. Mix in the flour mixture until combined. Pour batter into prepared pan and bake for 40 to 45 minutes, or until a tester inserted into the middle comes out with moist crumbs. Remove cake from oven and let cool completely on a rack before slicing. 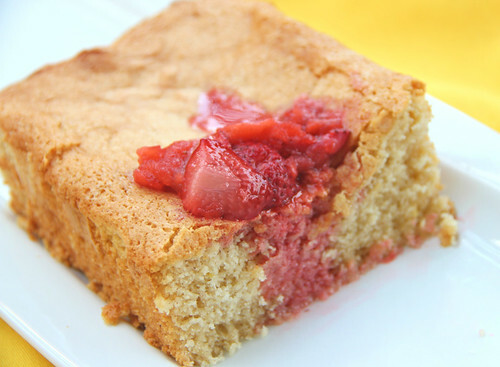 Serve with strawberry compote on the side. To make the compote, combine strawberries, grated apple and sugar in small saucepan. Cook over medium heat, stirring occasionally, as juice begins to form. Cook until strawberries reduce down and sauce thickens, about 10 minutes. Remove sauce from heat, cool and refrigerate. Serve on the side, with lemon pound cake. To celebrate the one-year anniversary of the Kosher Connection, we are giving away two prizes from Emile Henry, a Bread Cloche valued at $130 and a 4.2 qt Dutch Oven valued at $170! Two winners will be chosen at random. The contest winners will be contacted via email and will have 48 hours to respond before other winners are chosen. This contest is open to United States residents over the age of 18. Click this link to enter: Rafflecopter giveaway. 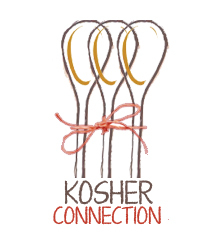 The Kosher Connection, an informal group of creative kosher food bloggers from all around the world, proudly presents our monthly kosher recipe challenge. Each month we will present you with recipes on a different theme from kosher food bloggers. This month in honor of our one-year anniversary we are celebrating with a blog swap and a giveaway! Each participant was assigned another person’s blog to make a recipe from, see what everyone chose below. You can also enter to win the giveaway from any of our blog entries. Follow our recipes on Twitter with #KosherRecipes. 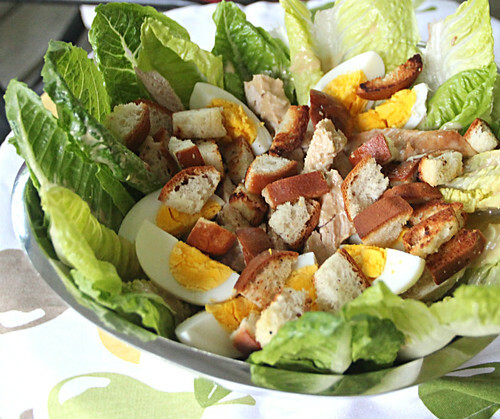 Caesar salad tossed with grilled chicken, homemade croutons, hardboiled egg and dressing. 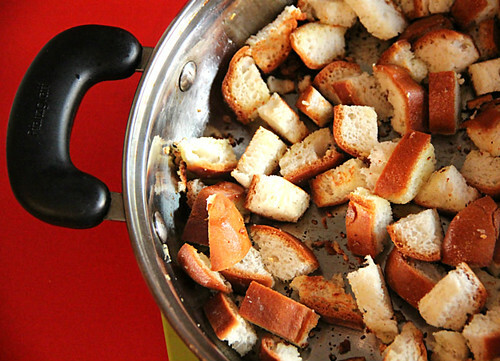 Homemade gluten-free croutons are toasted in a skillet with olive oil and garlic. For a light spring supper, here’s a good choice: grilled chicken Caesar salad with gluten-free croutons. I’ve never been a huge crouton fan. Dried-out cubes of tasteless bread never did a lot for me. But these fresh, homemade croutons — made from gluten-free crusty hot dog rolls toasted in a skillet with olive oil and garlic — are tasty and tender. Making the chicken Caesar salad took more time (and more pots) than I had anticipated. I needed to toast the croutons, blend the dressing, boil the eggs, grill the chicken and assemble the salad. Thankfully, my hero husband stepped in to help with the prep and to wash the multitude of pots. With some advance planning (not my forte), it would be easy to prepare most of the recipe in advance next time. Caesar salad dressing usually is made with raw egg yolk. But I get skittish about that, so I made a dressing without raw eggs. I also did not use parmesan cheese to make the Caesar salad dairy-free. My 11-year-old daughter recently had been asking me to make croutons (I’m totally serious). Oddly enough, the theme for the Kosher Connection linkup this month is croutons. Check out the link below for more recipes with croutons, though please note that most of the recipes in the linkup are not gluten-free. Heat olive oil and garlic in a large skillet over medium heat for 2 minutes. Toss in the bread cubes, and season with salt and pepper to taste. Stir to coat with olive oil and saute croutons until golden, about 5 to 8 minutes. Place the anchovies, lemon juice, garlic, Dijon mustard, balsamic vinegar, mayonnaise and Worcestershire sauce in a blender, and blend well. While the blender is running, slowly add the olive oil until emulsified. In a large, wide bowl, arrange some whole spears of romaine lettuce, so they fan out of the sides of the bowl. Tear remaining romaine spears into strips and place in the bottom of the bowl. Add grilled chicken strips and drizzle Caesar dressing over lettuce and chicken. Top with wedges of hardboiled eggs and gluten-free croutons. Serve with extra dressing on the side. Here’s a trick that’s a treat: Turn meringue cookies into spooky gluten-free, dairy-free meringue ghosts. I made these ghosts this weekend and should have posted the recipe earlier, but this spirited dessert is pretty easy to whip up with ingredients you have on hand. I used my trusted gluten-free meringue cookie recipe, and then my kids piped the meringues into ghost shapes, dipped a toothpick into melted chocolate, dotted on eyes and mouths and placed the little ghosties on a bed of crushed gluten-free chocolate cookies (we used KinniToos chocolate sandwich cookies) for a ghoulish effect. The hardest part is piping the meringues. Check out this Apartment Therapy: The Kitchn video about piping techniques. Happy Halloween! Preheat oven to 250 degrees. Line two cookie sheets with parchment paper and set aside. Using a mixer, beat egg whites on high speed until foamy. Add cream of tartar and salt, and beat until stiff. Add sugar gradually and continue beating. Beat in vanilla extract. Use a pastry bag to pipe the meringues into three-tiered ghost shapes on the parchment paper. Bake for one hour. Allow meringues to cool. Melt a small amount of chocolate. Dip a toothpick in the chocolate and dot eyes and a mouth on each ghost. 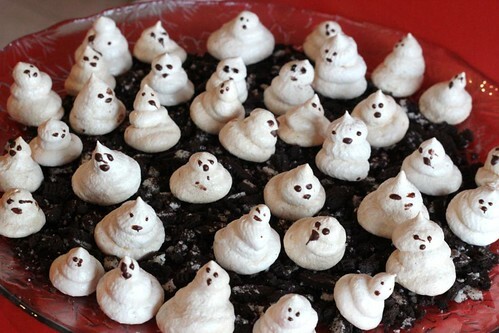 Place meringue ghosts on a bed of crushed gluten-free chocolate cookies.